ONErack is a universal, powered mounting system that vastly improves rack installation of small devices. tvONE’s patent pending design converts randomly sized, externally-powered devices from any manufacturer into slide-in modules that can be installed quickly and cleanly and serviced easily. 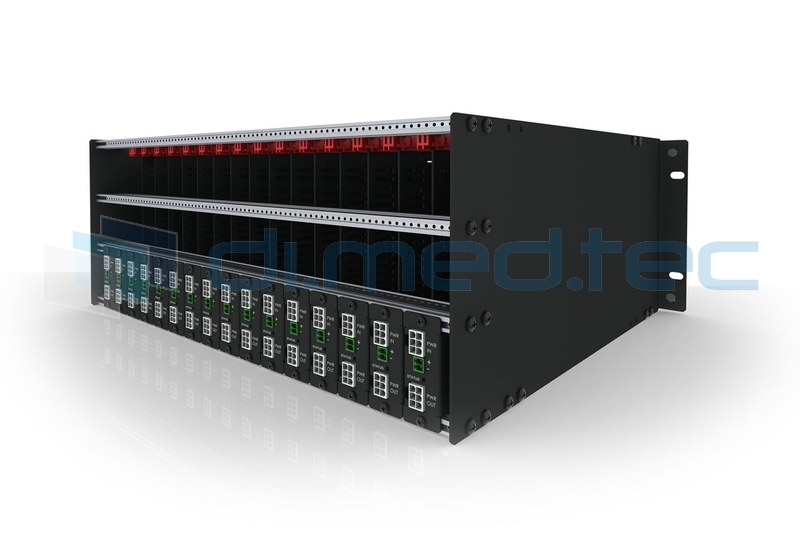 Chassis are available in 4RU, 5RU and 6RU and can hold up to 16 modules with up to 2 power circuits each. When using the ONErack Power Supply, each power circuit, can provide selectable power @ 5v, 7.5v, 9v, 12v, 18v, 24v up to 35 watts. A pass thru is available for custom power sources. Each ONErack Chassis can include 1 or more Power Supplies that can feed additional chassis, to allow for a clean power solution for all mounted devices. For service, just slide out a failed device, no cable ties, no guessing. Close the front of your ONErack with a Fan cover and keep it all cool. Up to 32 devices in just 4RU, powered and cooled!